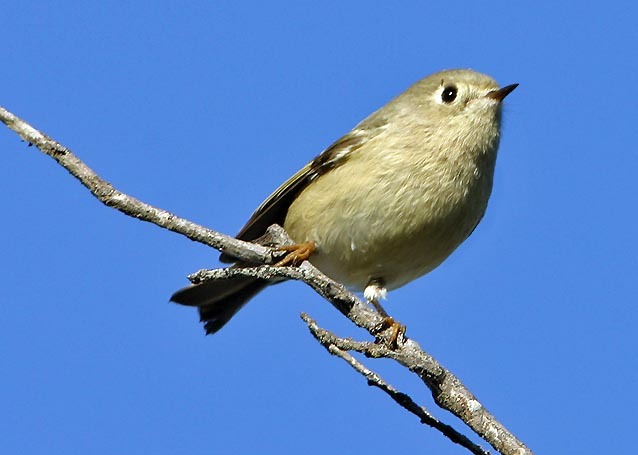 Kinglets are a small family of very small arboreal birds in the Northern Hemisphere. It is now undisputed that these tiny sprites deserve family status, as they are an ancient lineage, but their true place in the avian tree of life is still uncertain. As a group they are rather easy to recognize: very tiny, flitty, insect-gleaners of coniferous forests, all having a colorful crown pattern. 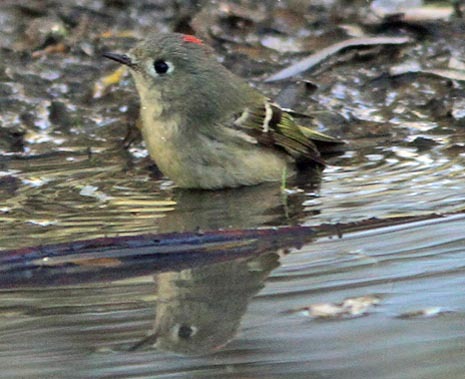 The common and widespread example in North America is Ruby-crowned Kinglet (left and below) which leaves its summer home in coniferous forests to spread widely in all sorts of woodlands in the lowlands for winter. This is the plainest of the kinglets since its ruby-red crown of the male is almost always hidden (but look for it in the bathing sequence below). However, when the crest is erected, it is striking and dramatic. 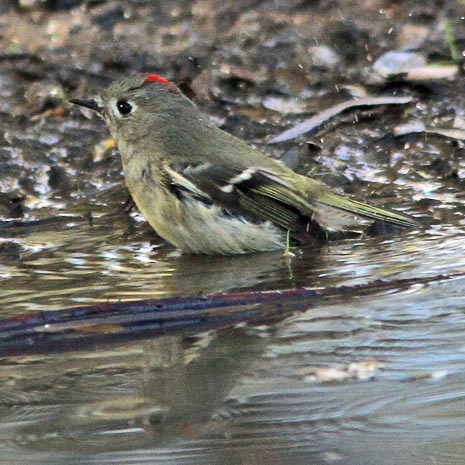 The first Ruby-crowned Kinglet that I ever saw — back on Christmas Day 1965 — had its crest up and was very agitated, full of "personality." It made a big impression on me, then a 13-year-old kid. 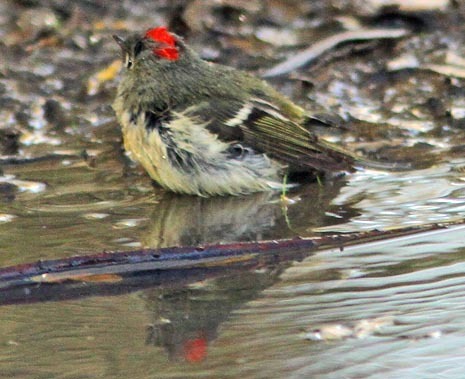 This male Ruby-crowned Kinglet (below) has found a small mud puddle in the trail at Andrew Molera SP, California, suitable for bathing. Note the very thin black legs (with yellow feet, in the perched shot above); the slim bill: and the black bar on the secondaries below the lower white wingbar (white tips to greater coverts). All six kinglets are in the genus Regulus. The other North American species is Golden-crowned Kinglet, a very hard bird to see well since it sticks to the tops of dense conifers, but here's a shot of a migrant at Pt. Reyes, California (left). Golden-crowned Kinglet has an extremely high-pitched call that, once learned, allows one to document their presence much more often. 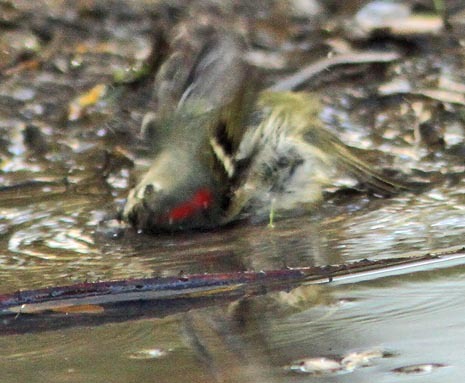 The male has lovely red stripe within the yellow crown stripe if you can ever see one decently. Females, like this, have simply a yellow crown stripe. 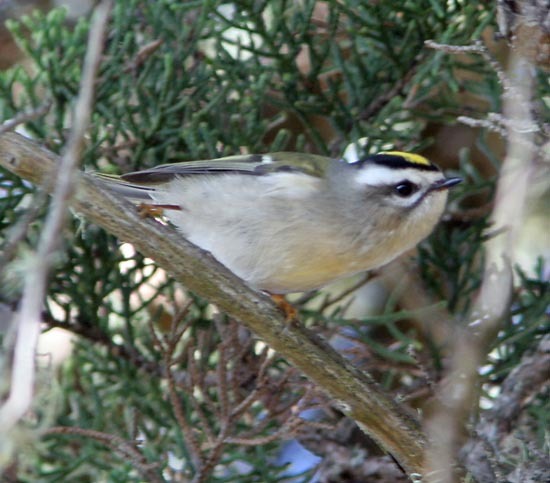 The Palearctic version of Golden-crowned Kinglet is Goldcrest (male below left © Graham Catley). Note the bright orange stripe within the larger yellow crown stripe in this male. 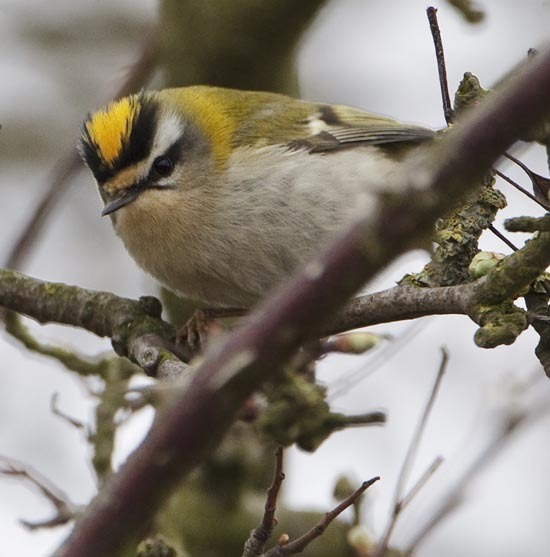 Firecrest (below right it a another great photo © G. Catley), has a more complex facial pattern that is really quite lovely. And below those two pics is a fabulous flight shot of female Goldcrest, also © Graham Catley. It is sure fun to look at some of these photos, because in the field these birds seem to be always moving and difficult to see well. 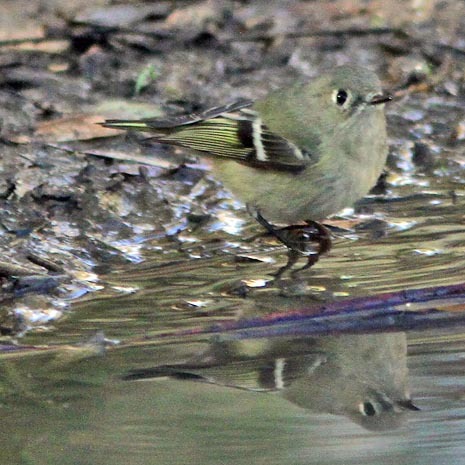 In western North America, particularly west of the Sierra Nevada and Cascades from California north to British Columbia, there is a significant field identification problem between Ruby-crowned Kinglet (a winter visitor to the lowlands) and Hutton's Vireo Vireo huttoni (a resident of oak and oak/pine woods). Even beginning birders should learn to separate these two common but similar species. I have a now-somewhat-dated page on the Identification of Hutton's Vireo v. Ruby-crowned Kinglet. Martens & Päckert (2006) explain that the very small size of these passerines is adaptive, "allowing regulids to exploit a special foraging niche on the thinnest of branches and in outermost canopies. In the case of those species which specialize on conifers, small size is particularly advantageous because it lets them manoeuvre in the small species between needles, or even perch on the needles themselves." Kinglets are traditionally treated as a subfamily of the Sylviidae (Old World warblers; Voous 1977, Urban et al. 1997), which was even the tentative plan for the Handbook of the Birds of the World project when it began. Some authors placed it as part of a broader Muscicapidae (Mayr & Amadon 1951, A.O.U. 1983) while Sibley & Monroe (1990) noted that "molecular data support ranking this group as a family of uncertain affinities (Sibley & Ahlquist 1990)" and placed them between the Bulbuls and Old World warblers. All of that occurred before the dramatic changes wrought be more direct mtDNA and (later) nuclear DNA evidence, which led to the "Break-up of the Old World Warblers" in the early 21st century. We now know that they are an ancient lineage — this was clear enough that by the time the applicable volume of the Handbook of the Birds of the World was published (Martens & Päckert (2006), the editors had changed their minds and elevated this small group to full Family status. Where they should be placed in the grand scheme of things is, however, still uncertain. They are apparently a very early offshoot in the Muscicapoidea [e.g., Barker et al. (2004), Treplin et al. (2008)] but whether they are closest to creepers or wrens or waxwings of something else is still a mystery. But let's not worry about that too much. Let's just marvel at another Graham Catley photo — a Common Firecrest giving us a great look at that fiery crown! 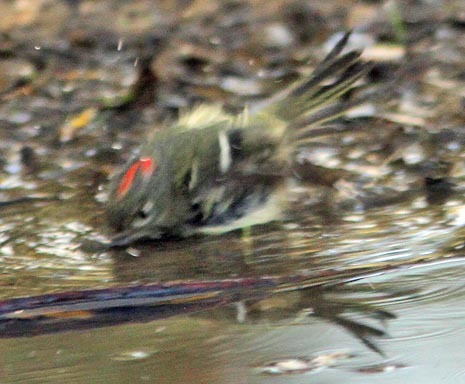 Photos: The initial Ruby-crowned Kinglet Regulus calendula was at Pacific Grove, California, on 5 Oct 2005; the puddle-bathing male was near the Big Sur R. mouth, Monterey Co., California, on 23 Nov 2012. The female Golden-crowned Kinglet R. satrapa was at Pt. Reyes Nat'l Seashore, California, on 11 Oct 2008. 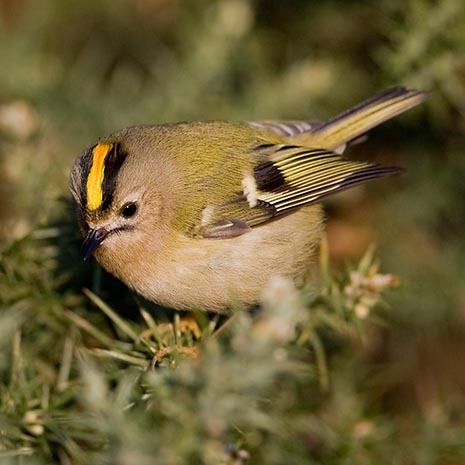 Graham Catley photographed the European species in Lincolnshire, Britain: male Goldcrest R. regulus on 11 Dec 2008 and female in flight on 22 Oct 2012, and the Common Firecrest R. ignicapillus on, respectively, 2 Apr 2011 and 20 Mar 2011. 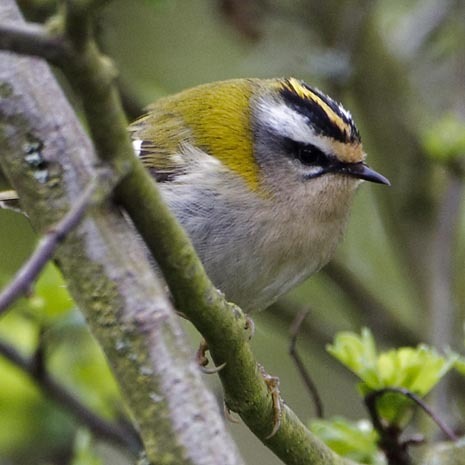 Photos © Don Roberson except the Goldcrests and Firecrests © Graham Catley, and used with permission; all rights reserved. Graham Catley has a lively blog with many great bird photos. Bibliographic note: There is no "family book" per se, but an introduction to this family, with some fine photos, is Martens & Päckert (2006). American Ornithologists' Union. 1983. Check-list of North American birds, 6th ed. Washington, D.C.
Martens, J., and M. Päckert. 2006. Family Regulidae (Kinglets and Flamecrest), pp. 330 –340 in Handbook of the Birds of the World (del Hoyo, J., A. Elliott & D.A. Christie, eds). Vol. 11. Lynx Edicions, Barcelona, Spain. Mayr, E., and D. Amadon. 1951. A classification of recent birds. Amer. Mus. Novitates 1946: 453-473. Sibley, C. G., and B. L. Monroe, Jr. 1990. Distribution and Taxonomy of Birds of the World. Yale Univ. Press, New Haven. Treplin, S., R. Siegert, C. Bleidorn, H.S. Thompson, R. Fotso, and R. Tiedemann. 2008. Molecular phylogeny of songbirds (Aves: Passeriformes) and the relative utility of common nuclear marker loci. Cladistics 24: 328–349. Urban, E. K., C. H. Fry, and S. Keith, eds. 1997. The Birds of Africa. Vol. 5. Academic Press, London. Voous, K. H. 1977. List of recent Holarctic bird species. Academic Press, London.